When you create certain reverse proxy services, (e.g. HTTP-HTTP), you'll see a setting that says 'Enable HTTP-specific monitor'. This short article will help you understand when you're supposed to use it. In order to check the availability of proxied servers, MFT Gateway uses a Health Monitor service. This service periodically attempts to connect to servers registered in clusters and mark them as "available/unavailable" for incoming client connections. In general, it just tries to establish a socket connection to the server host/port. But for HTTP servers, there's an option to verify if the server not only listens to the TCP port but also if the correct HTTP response is returned for the test HTTP request. For example, if we know that a particular HTTP server should return a particular HTML page in response to a specific request (and this indicates that the server works correctly), the 'HTTP-Specific' option can be used for verifying that. Note however that there are certain HTTP-based protocols that do not work well with this setting. One of them is AS2. For most AS2 servers, it is not recommend to use this option because AS2 responses are incompatible to the intended verification schema. 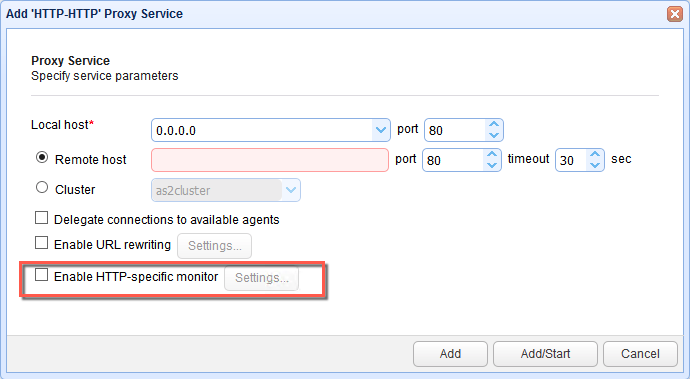 Thus, in the case of an AS2 cluster, it would be safer to use the Health Monitor without enabling the 'HTTP-Specific' option. This option is best suited for the usual Web servers.